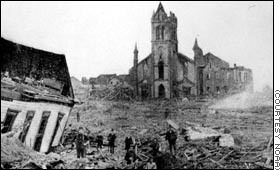 A Galveston, Texas, forecaster had dismissed as absurd the notion that a hurricane could devastate the island city. Then along came the storm that would turn into the deadliest natural disaster in U.S. history. The forecaster, Isaac Cline, later described the storm's aftermath as "one of the most horrible sights that ever a civilized people looked upon." A century later, we revisit the day the sea rose up and swallowed what was then one of the richest cities in America.